Tomorrow is Chinese New Year. It’s an important Chinese festival. 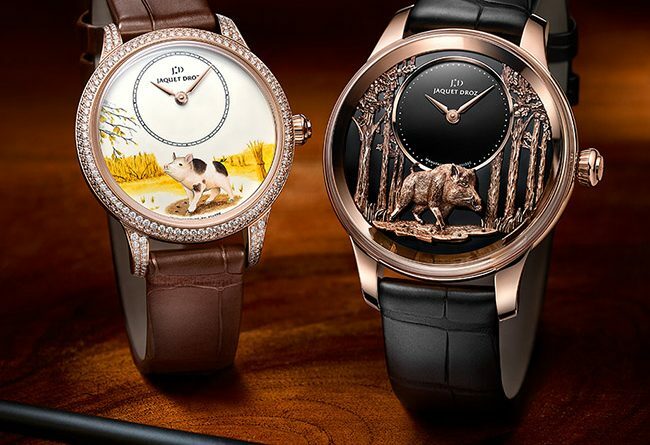 To celebrate, luxury watch brand Jaquet Droz will be introducing a new Chinese Zodiac watch collection. In modern Chinese, Chinese New Year is known as the “Spring Festival.” This festival is a popular time to celebrate the turn of the traditional, lunisolar Chinese calendar. Jaquet Droz is introducing the release of four, new luxury watch creations. This annual limited series collection features each animal of the twelve year cycle of the Chinese Zodiac. This year, 2019, marks the year of the Pig. As mentioned above, Chinese New Year is tomorrow February 5, 2019. We begin looking at a pair of Petite Heure Minute models in red gold. They are issued in a limited series of 28 pieces each. A stunning ladies’ version features a 35 mm case set with diamonds. In addition, a unisex version comes in 39 mm but does include a diamond setting. On both of these luxurious watches, the Art of Miniature Painting was chosen. The design depicts a young Pig in a field of wheat. Plus on the back of the piece, the gold oscillating mass is engraved with a similar scene. Engraving is the dominant art in the second new pair of limited-series pieces. First is the the Petite Heure Minute Relief Pig. A wild pig is depicted in front of eight oak trees. As a result, the number eight is considered very lucky in Chinese culture. Both models feature an onyx hours and minutes disk in sheer bottomless black. The first version of the Petite Heure Minute Relief Pig is a limited series of 28 pieces. This Jaquet Droz watch has the black onyx contrasted with a 43 mm red gold case. The stunning case features a red gold engraving. The second version is a limited series of eight pieces. Each watch features a gorgeous white gold case. In addition, the engraving accentuates the black onyx of the disk. Plus, the case and lugs are set with diamonds. In both models, the boar depicts in a relief engraving on the oscillating mass. Therefore, an onyx applique provides the dramatic backdrop. Owning luxury watch is often a top desire by most people. It makes a fashion statement, as well as a represents a status symbol. Giving a luxury watch is a perfect gift for that special someone in your life. A spouse, co-worker, relative or good friend will all appreciate receiving a fine watch. So celebrate the Chinese New Year and give a gift of fine jewelry. Make it a big day nobody will ever forget. Whether it’s a birthday, anniversary, job promotion, Christmas or anytime of the year, make it special. The Life of Luxury can help you locate and purchase all the major luxury brands around the world. So enjoy life and celebrate the Chinese New Year in VIP style.